We usually focus on the meat or vegetables in our meals. 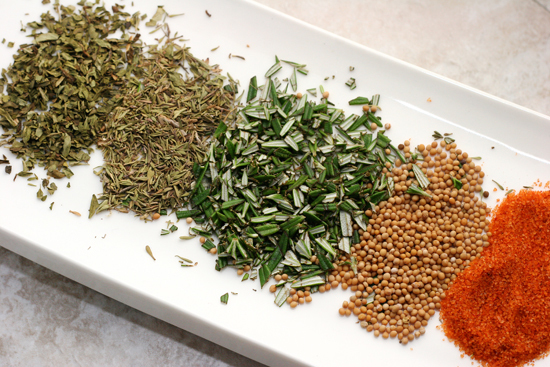 Take a look at some of the most commonly used herbs and spices that give flavors to our food. Allspice is the harvested unripe berries of a tree. It’s also called myrtle or Jamaican pepper, newspice or yenibahar. 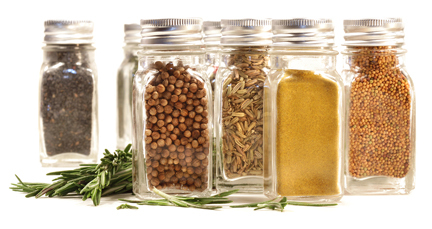 Anise or Aniseed is valued for its seed which is harvested fresh or ground. It’s also used for tea, liquor, and medicine. Basil has many varieties but the most commonly used are sweet or Genovese, lemon, Thai, African blue, and holy basil. The seeds are also used in desserts and drinks. Bay Leaves come from different aromatic plants such as bay laurel, West Indian, Indian, California, Indonesia and Mexican bay leaf. Black Pepper is a dried and cooked unripe fruit of a flowering vine. The dried fruit is called peppercorn. Green peppers are the dried unripe fruit, while white peppers are the ripe fruit seeds. Cardamom comes from the seeds of the Amomum and Elettaria. It’s also used in drinks and harvested for its essential oil. Cayenne Pepper comes from the fruit of a plant related to paprika, bell pepper and jalapeno. The fruits are dried, ground, or used fresh or as flakes. Cilantro or Coriander is an herb cultivated for its seeds, fruits and leaves, but the whole plant itself is edible. Cinnamon may be ground or sold in sticks. They are taken from the bark of Cinnamomum trees. Common types of cinnamon are Indian, Malabar, Chinese, Vietnamese, Ceylon and Indonesian. Cumin is valued for its seed which may be used as whole seeds or ground. It’s from a plant native to South Asia and the Mediterranean. Salt is a mineral made up of sodium chloride. It’s taken from evaporated seawater, spring waters and salt mines. Garlic may be used fresh or ground. The bulb of the garlic plant is divided into smaller sections called cloves. Its flowers and leaves are also edible. Ginger has a rhizome used as spice and ground or used fresh. Similar plants such as the galangal or krachai and wild ginger also produce the same aroma. Marjoram is an herb valued for its aromatic leaves which are harvested green or dried. They are also distilled for oils. Onion has a part called the bulb. The plant, called spring onion or scallion, can be harvested while still young. Onions come in three colors; brown or yellow, white and red. Oregano is a flowering plant. Its leaves are dried and sometimes extracted for its oil. Paprika is a mix of red air-dried fruits of the bell pepper and sweet pepper. Other spices are also included. Parsley is a flowering plant used as a vegetable, spice and herb. The most common types of parsley are leaf and root parsley. Rosemary is an herb also used as a decoration. Its leaves are harvested fresh or dried for cooked dishes or tea. Thyme is sold by sprigs (or a single stem with leaves and flowers) or dried. It is also harvested for its oil. Turmeric is an herbaceous plant harvested for its rhizomes. They are used fresh, boiled and dried or ground.